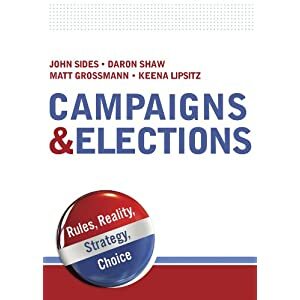 Hi everyone, as John Sides has already written, my name is Jonathan Robinson, and I’m an undergraduate in political science here at GW. I will be writing up a couple of regular posts here at The Monkey Cage. I hope you enjoy them. Source: Matthew Dickenson‘s blog, You Study Politics, Right? Data: Cooperative Congressional Election Study. 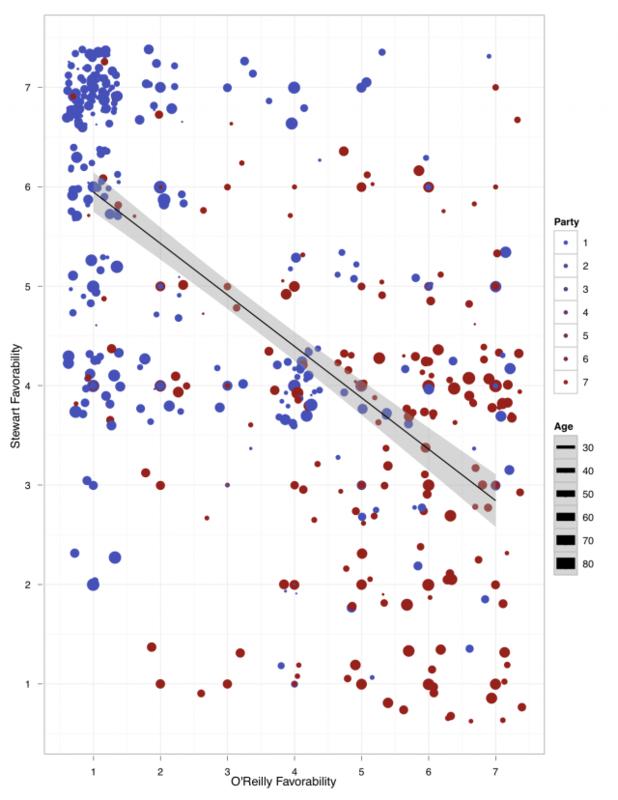 The graph aggregates respondents by age (the thickness of the data points) and party identification (the color, ranging from red to blue). A few observations. There is the obvious negative correlation: viewers who like Jon Stewart tend not to like Bill O’Reilly. Not surprising, of course. More interesting: there are lots of people who love Stewart, giving him really high ratings, but fewer who love O’Reilly. Among O’Reilly’s rabid supporters, more have middle-of-the-road feelings toward Stewart than very unfavorable feelings. Age seems to have little to do with feelings toward either pundit. Would the line not appear flatter if the aspect ratio was constrained to 1? Jonathan, It’s pretty. Four variables is a lot to display at once. I’m not sure I am getting anything out of age/thickness. And so is the line a bivariate regression? I’d rather see multiple lines of y-hat from your full regression, by age if that is a factor that matters in your analysis, but you claim it is not. So why muck up the graph with extraneous and fairly confusing information? Otherwise, cool! Note that it’s not Jonathan’s graph, so the “your” isn’t really appropriate here. I have to agree with the above commenters. First of all, the axes should be square. Since this appears to be done in ggplot2, you can add +coord_equal(ratio=1) to keep it square. I know the point of the Graphiti feature is to present graphics on their own, but sometimes a little explanation is necessary. For instance, what do the 7 gradations of party mean? Presumably the ordering goes something like: strong dem, weak dem, dem-leaning independent, neutral indepentdent, etc. However, new research suggests that leaning independents are actually more partisan than weak partisans, i.e. a weak Democrat can be expected to be less supportive of Democrats than a democratic-leaning independent. As such, the shadings are a bit misleading. Finally, I’d say that there isn’t an obvious relationship with age, so the different sized dots are sort of useless and confusing. This graph could have really used more explanation, as it’s just not up to Monkey Cage standards. I agree with the comments about the axes (a square plot would be a little better) and features could probably be labeled more clearly. But I disagree with the comments about removing age from the plot. The consensus seems to be that, because no strong pattern appears between age and the favorability ratings, age should be discarded. I completely disagree. The (lack of) pattern between age and favorability is the most interesting feature of the plot. Before seeing this, I would have guessed that Stewart appealed mainly to young people and O’Reilly appealed to the middle-aged and up group, perhaps with Stewart having more appeal across parties. But O’Reilly’s appeal among young people seems to rival Stewart’s! Contrary to some of the other repliers, I really like this plot. It clearly plots four relevant variables and, most importantly, it really sparks my interest. That is what a good plot should do. I’ll just add that the point of “Graphiti” isn’t for us to explain every feature of the graph. Nor is it to pick a graph that everyone thinks is perfect. As Carlisle says, the point is to pick something that is interesting. In most cases, we will be able to link back to the source where there will be more detail — although the link doesn’t have much more information in this case — and we would encourage readers to go to that source as well. I don’t believe there is a single reader who expects you to “explain every feature of the graph” nor “pick a graph that everyone thinks is perfect.” Every commentator has made relevant points in a respectful manner, yet you seem to be taking am unusually defensive and somewhat personal tone. What’s the point of putting up a graph if readers are discouraged from critiquing it? It’s all in good fun. WesM: I wasn’t taking anything personally. Brad said “This graph could have really used more explanation, as it’s just not up to Monkey Cage standards.” I was just clarifying what our standards are for Graphiti (something interesting) and what readers should expect that we will do in presenting these graphs (fairly minimal explanation). If people want to critique any of the graphs, that’s fine, although I would have been pleased in this case if commenters had devoted some attention to further interpreting the graph rather than critiquing its aspect ratio. Let me just say, I love love love that everyone’s getting into graph criticism!